Permafree is a common term in the indie author world. Many authors will vouch for the strategy. The strategy is to set the first book in a series free (ebook formats only of course) to encourage new readers to try the book. The theory is the reader will like the book and be willing to pay for the rest of the series. Many independent authors have had tremendous success with this strategy. However, most of these authors are also writing adult or young adult fiction, not kids' books. The children's book market is a bit different and its transition to ebooks has been much slower. But there is evidence that more and more kids are reading on iPads and Kindles. With all this is mind, I decided to try permafree for my children's chapter book series. I had three books out, and I wanted to try something to spur some sales. In the beginning of November, I set the first book in The Adventures of Zelda series free in ebook format on all platforms. I spread the word via social media, and I also had my friend Chubbs the Wampug tell her followers. (Chubbs is a pug celebrity) Since then, I haven't done any other advertising. After almost three months of permafree, The Adventures of Zelda: A Pug Tale hovers around number 5,000 in the Kindle Free Charts with some spikes. Those spikes are usually around 150 free downloads in one day. Otherwise, my downloads range from 10-50 on a typical day in the Amazon Kindle Store. In December, I saw record number of paperback sales for the Zelda series as a whole, selling over 100 books. November was strong for paperback sales as well. To date in January, ebook sales for the second and third book of the Zelda sales have risen to their best month with a week left still in the month. I'm selling a few copies of the second and third book each day in the Kindle store. The other platforms are not doing much for me. Apple's iBooks is the only store that moves copies. Usually, I have about 5 free downloads a day of the first Zelda book with a few sales here and there for the second and third Zelda books. Nook, Kobo, Smashwords, etc aren't moving any books most days. It's hard to know exactly what spurned my jump in sales, but I'm sure permafree was a big component. Going permafree made Zelda start appearing in also boughts on Amazon all over the place. It kept me at the top of the free kids' pet books charts. I'm happy with the results so far. I realize my numbers aren't huge. I realize I'm not making thousands of dollars, but in a very tough children's ebook market, I'm happy with the growth. I'm happy that kids and parents are enjoying the series and continuing with it past book one. I'm also happy with the results because I haven't paid a dime for any advertising yet. That's the next step. And writing book four! Are there any other children's book or middle grade authors out there? Any success with permafree? In June, I released my first full-length young adult novel. This first novel took several years to write, edit, and publish, but I'm proud of the result. In 2014, I visited three elementary schools for Author Day events. During these events, I spoke with students about writing, publishing, pugs, and sold lots of Zelda books. I loved Author Visits and have more planned for 2015. I also set up a table to sell books at many community events and enjoyed those outings as well. Overall, I'm very pleased with my writing output and sales in 2014. 2014 was the first full year of writing seriously, and I'm happy with the results. With the successes of 2014 in mind, I've started planning for 2015. I have a few goals in mind, and I'm working out the others. Here's a few I can share. I'm currently working through edits on The Evolution of Lillie Gable, my second contemporary young adult novel. I'm happy with the story, but I have a few details to work out. Either way, the book should come out this spring! The fourth schedule is next on the project list. I expect an early summer 2015 release. It should be another fun book! I wrote the first story of a new spinoff series from the Zelda books for my newsletter subscribers and Wattpad fans. Batpeach will return in 2015 with more fun crimefighting stories! With my increased writing output and stories available, I will be posting more sneak peek snippets of my novels and stories. I also am stopping my monthly book reviews posts. I'm not reading as much at the moment, so it seems silly to have a monthly post with one or two books. Instead, I will post a review or highlight a book I loved. That's a portion of the plan for 2015. I'm excited for this year and my writing career! What were your successes in 2014? How can you build on those for 2015? My part time day job is tutoring children in reading. I teach the mechanics and phonics of reading, along with comprehension. We encourage our students to bring in books to read for fun for the last ten minutes of each session. A few of my students requested to read the first Zelda book, and we read a chapter every couple of days. As an author, I love that kids read and enjoy my books. With the Zelda books, I'm thrilled to receive an email that their son or daughter begged to keep reading Zelda each night before bed. But, when I read my own books again, I want to throw them out the window and start over. Let me explain. Even when a book is "finished" or published, I find more sentences to change or chapters to revise. It's a never-ending process for me. I haven't read The Photograph since publication for that reason. One of the benefits of being an independent author is the freedom to revise after publication. That's what I am doing right now. I am revising the first Zelda book. I'm not changing content, but sentence structure and word choice. I wrote the first Zelda book a few years ago now, and since then, my writing has improved. I don't envision doing this for my other books, but it makes sense for the Zelda series. The Adventures of Zelda: A Pug Tale is my best selling book. I travel to schools and events with this book, and with plans for a fourth and fifth book, the first needs to be strong so readers come back. The revised version of The Adventures of Zelda: A Pug Tale will be available in a week or two. I'll post when it is available, so pick up a copy (it's free in ebook form right now) and let me know what you think! Authors - Do you want to revise after your novels are published? Why or why not? It's almost November, so writers of all sorts are scrambling to get ready for NaNoWriMo (aka National Novel Writing Month). If you aren't familiar with NaNoWriMo, the goal is to write a 50,000 word (or more) novel in the month of November. That averages to about 1,667 words a day. It's a fun challenge, and The Photograph was born out of NaNoWriMo. But I am not participating this year. I'm in the middle of revisions for two novels, so it doesn't make sense for me to put those down right now to start something new. But for those who may be trying NaNoWriMo for the first time, I thought I could send some tips your way to help with your productivity. Three years ago, when I wrote the Photograph during NaNoWriMo, 1,667 words a day sounded terrifying. These days I set a goal of 3,000 words a day (usually in 2-3 hours time) when I'm in first draft stage. I know some of the productivity increase is because I have more words under my belt. The more you do something, the easier it gets. However, I know the biggest boost in productivity comes from writing in silence. What is writing in silence? It's exactly how it sounds. I remove all possible distractions and write. Here's the steps I take. I get a drink (usually caffeinated) and sometimes a snack and sit down at my computer in the office. I put my iPhone on silent mode and flip it over so I cannot see the screen. (I'll be honest, nobody calls me, but if they did, and it was an emergency, I could still answer it). It's pretty simple, but it's been super effective for me. Without distractions, I get in the writing zone quicker. Usually after writing around 1,000 words, I'll get up and take a break for five minutes. Then it's back to it. Like I said, writing in silence has helped me write faster. If you are trying NaNoWriMo, I suggest you find a distraction free area to write. It will help tremendously. I do acknowledge that distractions can come up despite your best intentions. This happened to me the other day. That's my tip for the NaNoWriMo folks. Enjoy November and good luck! What are your productivity hacks? A few months ago, I wrote a post called Marketing on No Budget. I was looking for cheap ways to promote my books. I came up with a few ideas, most of which were local events or options. By far, the most successful marketing idea was the Author Day. The author day is not a new idea, but a relatively new idea for me. Since I write children's and YA, author days are a natural fit. I contacted a few local elementary schools and asked if they were interested in hosting me for the day to talk to the students about being an author. I booked two schools for author days in May. For one school, I spent the day with second graders. I met with six classes for 45 minutes each. I read from The Adventures of Zelda: A Pug Tale, led a discussion about reading and pugs, and talked about the "author life." I had a blast. For the other school, I spent the day with fifth graders. I met with five classes for 45 minutes each. I read from the Zelda book and also led a discussion about the origin of my stories and the writing process. Since the students were older, I left more time for Q&A. I was asked great questions. My favorite was "what is your world view as an author?" Here are my takeaways from the experience. 1. Author days are fun. I had a blast at the author days. I loved sharing my experience with the students and teaching them about writing. I'd do it again in a heartbeat. I do realize some authors may not enjoy public speaking or teaching kids, but I have a background in education and working with kids and teenagers, so it fits me well. 2. Author days are exhausting. I came home both days wiped. Although I enjoyed the days, all the time up front is exhausting for me. The preparation for the days wasn't bad, but it wouldn't be great to schedule days back to back. 3. Author days sell books. For both schools, students in the classes associated with the visit took home fliers about my books to pre-order signed copies. For one school, they simply brought in the order slip with the cash or check. The other school didn't do any cash transactions at school (interesting), so I set up an online ordering and payment option. I set a preorder deadline for a week before the scheduled author date, so I had time to get the books signed. The second grade classes sold more books, but it's hard to say whether it was the grade level, school, or teacher promotion. But the fifth grade still sold enough books to make the visit worthwhile. Both were successful mechanisms to sell books. 4. Author days are a great way to build your platform. I sent all the students home with a Zelda bookmark with my website information. In addition, my name is more familiar with the teachers. I'm sure some students will read Zelda and enjoy the books. They may even tell their friends, and more kids and adults will know of a little pug named Zelda. With school out for the summer, author days are on the back burner. I look forward to scheduling one to two author days a month next school year. If you are connected to a school in the greater Cincinnati or Cleveland area, I'd love to come visit! I'm always looking for more marketing ideas, especially lower cost options. Have you had any success marketing with no budget? I have a secret to tell you. I don't think The Photograph is the best novel ever written. I don't think it's the best contemporary young adult novel that will be published in 2014 or June of 2014. I do think The Photograph is a great novel for a specific group of readers–my target audience. The Photograph is targeted towards girls ages 12-16, specifically athletic girls. The teenagers who fit that demographic are much more likely to enjoy the book than other readers. For instance, the novel has an element of mystery and intrigue in it which may attract readers not in my target audience. If you are a 33 year old man, you may still read and like The Photograph, but the chances are much lower. As an author, it is important to know who your readers are for each book. The writing in my Zelda books is different than The Photograph which is different than the current project targeted towards an older YA audience. You can't write for every reader. It doesn't work. Plus, the target audience also affects your marketing and promotions. Let me give an example. My Zelda books have a unique audience. Reading level wise, they are targeted for students in grades 3-5 (ages 7-11), specifically kids who like dogs. However, the secondary target audience is pug owners of all ages and demographics. 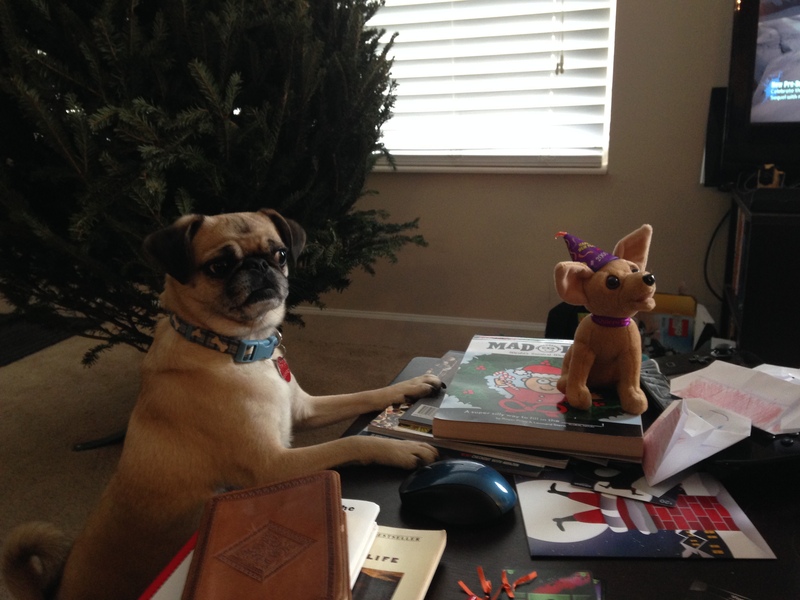 People love their pugs and love anything to do with a pug, so they buy Zelda books. So in addition to Author Day presentations at elementary schools, I also market Zelda through ##pugchat on twitter (it's a thing) and will be selling books at Pug Fair in September (also a real thing). Who is your target audience? How do you market to your audience? I want to start off this post by telling you that life is good. I am happy. I love the move we made from Cleveland to Cincinnati. It was definitely the right move for us. I have no doubt. I say this because moving isn't easy and it isn't cheap. Neither is a quality editor or book cover designer. These facts have left me with nothing in the budget to spend on book marketing for the next few months. With no money to spend, I am forced to be creative and get out of my comfort zone to market and sell my books. I need to sell books so I can continue to pay for a quality editor and book cover designer. It's an endless cycle!! (At least until I get the next few books published) For indie authors, there are many paid opportunities to market your books. Bookbub is one of the most popular. If you are approved and pay the appropriate fee, your book is featured on a daily email that is sent to thousands of voracious readers. Bookbub is at the top right now for book promotion, but there are other options. The Fussy Librarian, Kindle Nation Daily, or Pixel of Ink are other options. You can buy twitter, facebook, or goodreads ads. All of these can help your book sell, especially in a hot genre. Of course, children's books don't do as well with these promotions because of the audience even if I had some money to spend. So what if you need to market books on little or no budget? Book Signings - Set up a book signing in your local coffee shop, bookstore, or ice cream shop. (Who doesn't want to eat ice cream while they get a book signed?) Spread the word to everyone you know. Print out postcards and hand out to strangers. (It's easier to hand someone a postcard then to ask them to buy your book) Use facebook events (perhaps the only useful function of facebook) to promote. Make sure you have plenty of books on hand, cash for change and a square reader for credit card payment. Then have fun! Even if you only sell ten books, the event only cost you minimal time and no money. And now you have ten new readers. Author Days - Author Days consist of visiting a local school, usually an elementary school, reading to the kids, talking to them about being an author, and signing books. Kids can purchase copies of books in advance and you can have them signed ahead of time to save time. This is a great idea for fellow children's book authors. I also think YA authors should consider visiting middle and high schools. I am sure teachers and students would find value in the visit. Local Events - Find out what is happening in your area and set up shop with a table to sell books. On my end, I am going to have a table at the Cincinnati Pug Fair (yes it is a real thing!) I am also looking into a table at a Farmer's Market and children's events in the area. Workshops - I like teaching. My workshops are either writing or faith based. I've led the workshops at community centers, churches, and libraries. I always end up selling books in addition to my fee for teaching. Those are a few ideas I am currently pursuing to market books and gain new readers. This type of marketing takes more time, but I believe the personal connection pays off in the long run. What are your ideas to market books on no budget? Also, I wanted to give a quick thank you to all of my wordpress followers. The number continues to increase. I hope you find value and some laughs here with my blog. If you want to join my street team, you can sign up here. The Street Team knows first (before the blog!) about new writing projects, promotions, and the opportunity for free advance review copies. The path to a "successful" writing career is tough. Anyone who tells you otherwise is lying or one of the very lucky few. (and I mean few). Reaching your goals as an author takes time and hard work. And many times, in the middle of working your way to those goals, you want to give up. You want to throw in the towel and try something else. But, it is the authors who make it through those rough moments and keep writing who are successful. Today's post is to highlight those rough moments in a writing career and encourage you through them. I press through the tough times and when I do, I catch glimpses of light. And I know if I keep writing and working, the light will grow. 1. Starting - The hardest part about writing for me happens every day when I try to sit down and get words on the page. I must fool around for 20 minutes every day avoiding the inevitable: writing. I have a hard time starting, but I force myself to do it every day or hour I set aside to write. The funny part is once I get rolling, once I have a paragraph or two down, the words flow and I'm in the zone. But, sitting down every day is a struggle. The good thing is I have acknowledged this problem and have tools in place to help get me rolling. First, I put Scrivener in Full Screen mode on my mac. That way, I can't see emails or notifications coming through on my computer. If I'm feeling super distracted, I will turn off the wi-fi on my computer. I also turn my iPhone over so the back is up. I can still hear it vibrate for texts and phone calls, but again don't see notifications coming through. Finally, I set a timer for 20-30 minutes with a word count deadline because I know deadlines help my productivity. My encouragement comes every session I am able to exceed my word count goal and fight past my starting problem. I know every word I write is a step closer to another book being on the market. 2. Waiting - An author spends lots of time waiting. If you submit query letters or manuscripts to agents, you wait for weeks (or months) for responses. When you work with an editor, you wait for the edits to return to you. Or you wait for your designer to finish you book cover. Finally, you wait for your book to be published- with traditional publishers it could be a year or more. Even with self-publishing, you are at the hands of Amazon, Kobo, Smashwords, etc to put your book up for sale. It can be torture sitting around and waiting for the next step in the process. My advice is to stop waiting and write something else. Every day you wait for your manuscript to be returned with edits is a day you could have worked on your next novel. Honestly, most of the time, I have too many projects I want to write and not enough time to write every day. Unless you are banking on your one book to be a bestseller (hint - not a good strategy), write while you wait. 3. Rejection - Somebody isn't going to like your book. Agents will reject your query. A bad review will pop up in the Amazon review. All of these will happen so prepare yourself for it and make a plan to counter the rejection. For the person who doesn't like you book, ask them why. Maybe you can learn something to help your next book better. For the rejected query, ask the agent what they are looking for or why your novel didn't fit their criteria. Or if you love your project, hire an editor and publish it anyways. Rejection is going to happen so don't let it discourage you. Instead, focus on what is working and the fans you have. If you want to make writing a career, you need to survive those tough moments. Writing is a long-term strategy. You keep building up your catalog of books, improving your craft, and bringing in more fans of your work. Each book is another step in the direction of success- of making enough money from your writing to support yourself or your family. Keep reading, learning, and writing, even when you feel like you will never reach your goals. You can make it. Today's post is the third in a writing tips and advice series called From One Writer to Another. First, I tackled some general advice, then I told the truth about blogging, and I gave a few tips to write fiction faster. Today's post tackles self-publishing. About a year ago, I wrote a post called the Ins and Outs of Self-Publishing talking about the advantages and disadvantages of self-publishing. I still agree with what I wrote then, but I wanted to add a few more notes about what I've learned about self-publishing after releasing another book. All of this is to say it is true anybody can self-publish. Even if you can't figure out the formatting, someone will do it for you for a nominal fee. And that my friends is what is amazing about self-publishing. There is a way to put your words out in a format for others to read. I love it. I am able to pass out books and spread the word about my writing through self-publishing. I am building a name for myself. It's great. But, the road to self-publishing success is long. Unless you are the lucky one of one million writers, your first book isn't going to sell enough to pay your bills, even if it's a great book. Success in the self-publishing arena takes dedication, patience, and consistency. And so, if you want to be a successful self-published author, write a book, publish it, and then immediately start writing another. Realize your success will come down the road when you have several books out for readers. So keep writing and get a critical mass of books published. Focus on writing good books first. When you have published three to five good books, it is time to start the serious marketing. Start looking for ways to advertise and reach new readers whether that's paid advertising, blog interviews, book signings, etc. Then when you find new readers, they have another book to buy, and your name to pass on to other readers. If you look at the majority of successful indie authors (Lindsay Buroker, Johnny B. Truant, Sean Platt, J.F. Penn, David Wood, Hugh Howey), they have several books out, usually in the double digits. When you have 5, 8, or 10 books out, it becomes much easier to market and spread the word about your writing. So that's my strategy, especially in the next nine months. I'm focusing hard on writing fiction, less on workshops, marketing, and even blogging (although I still will do it). The plan is to have at least two more fiction books out by next summer and then market my name. I believe in self-publishing and making a career of writing. But, I understand the time and commitment of doing it, and I'm willing to make the sacrifice. What do you like about self-publishing? What don't you like about self-publishing? Today's post is another in the From One Writer to Another series. So far, I've written advice for newbie writers to get started and the truth about blogging. This week, I am sharing what I've learned about writing fiction in the past couple of years. I think writing fiction is much more difficult than writing nonfiction. You need to create characters, timelines, settings, and details within an overarching narrative. And then, you need to make sure it works, meaning there are no plot holes or discrepancies in the details. My first piece of advice for fiction writers is to read for pleasure. Pick up a book and read every day. But, don't dissect every sentence or chapter. Instead, read the book for the story and enjoy it. When you finish a book, think about what you liked and disliked about the story. Doing this will help you become a better storyteller, which helps you writer better fiction. On a side note, I now write short book reviews for every book I read on Goodreads and post the reviews every month. The book review process takes very little time, but really has centered my focus on what I like in a story. My second piece of advice is to outline your story before you start writing. When I say outline, I don't mean write out every single thing which will happen in your novel or short story. I do mean write a rough outline of the major plot points and conflicts. This allows room for creativity as you write without getting stuck in the tenth chapter because you wrote yourself into a corner. I started off as a pantser, but have moved on to outlining, which is a more efficient method of writing. My third piece of advice is to use character timelines. If you are writing a novel, I am sure you have a complex storyline with many characters. The timelines between these characters must add up and make sense. So I use timelines for the major characters to help sort through ages, dates for major story events, and backstory. It has helped me tremendously. When you are writing, put yourself in the story. Visualize the scene and the characters and write what you see. I can see my protagonist in my novel, Rachel, and her reactions to tough moments because I remember my reaction and others' reactions to tough moments. Put yourself in the story and write. Finally, carry a small notebook with you (or use an app) to take notes about life everyday. If you meet an interesting person, write a small note about what made he or she interesting. Story ideas and new characters pop into my head often when I am not sitting at my computer writing. If I didn't write them down when they came to me, the ideas might get lost in the shuffle. Watch the world. Observe. Take notes. Honestly, I wish someone told me these five pieces of advice (especially 2 &3) before I started writing my first novel. I probably would have finished the project six months earlier! What advice do you have for fiction writers?